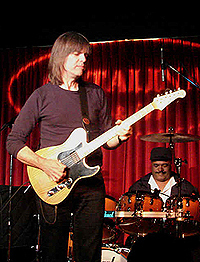 When I last saw the guitarist Mike Stern at Yoshi's San Francisco, he was performing alongside the incredible drummer Billy Cobham, as well as keyboardist Mark Soskin and bassist Victor Bailey. Cobham's reprise of his "Spectrum" era repertoire thrilled the audience, as did Stern's incendiary solos. Later that week, Cobham would play Yoshi's Oakland with an all-acoustic line up, featuring the brilliant trumpeter Randy Brecker, another longtme Cobham alum. Now Stern and Brecker return to Yoshi's for a weekend of music with drum virtuoso Dennis Chambers and bassist Anthony Jackson. Stern and Brecker will also participate in the Jazz Heritage Center's popular lecture series, "We're Talkin' Jazz" on Sunday. In a career that spans three decades and a discography that includes more than a dozen eclectic and innovative recordings, six-time GRAMMY nominee Stern has established himself as one of the premier jazz and jazz-fusion guitarists and composers of his generation. In August 2009, Stern released "Big Neighborhood". Aiding him in this latest chapter in his never-ending quest for the new and better groove is a long list of talented guests: guitarists Steve Vai and Eric Johnson; bassist-vocalists Esperanza Spalding and Richard Bona; jamband godfathers Medeski Martin & Wood; drummers Dave Weckl, Terri Lyne Carrington, Cindy Blackman and Lionel Cordew; bassists Chris Minh Doky and Lincoln Goines, saxophonists Bob Franceschini and Bob Malach, trumpeter Randy Brecker and keyboardist/producer Jim Beard. Meanwhile, Randy Brecker has been shaping the sound of Jazz, R&B and Rock for more than four decades. His trumpet and flugelhorn performances have graced hundreds of albums by a wide range of artists from James Taylor, Bruce Springsteen and Parliament-Funkadelic to Frank Sinatra, Steely Dan, David Sanborn, Jaco Pastorius, Horace Silver and Frank Zappa. On Sunday, there will be an intimate pre-concert talk with these two premiere jazz performers. Mr. Stern and Mr. Brecker will be interviewed by jazz educator and blogger, Wesley Watkins, Ph.D., with time for audience Q&A. This talk is free to members of the Jazz Heritage Center and ticket-holders for any of Mr. Stern's performances at Yoshi's, December 3-5. The Jazz Heritage Center's Media and Education Center is located at 1330 Fillmore at the rear of the lobby, next to Yoshi's box office.